Because wedding day photo shoots are often rushed and stressful, engagement sessions are becoming more and more popular. 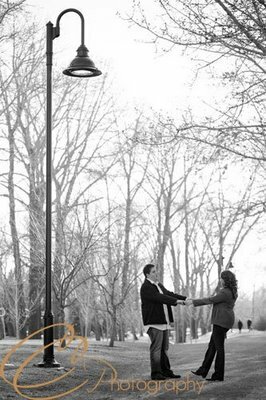 You can incorporate these engagement photos in your wedding invitation, as save the date cards, or as table markers during the reception. During engagement sessions, you and your groom can be more relaxed and take all the time you need to get the perfect shot. But the key to getting the most creative photos is choosing the perfect location. In the Rain: While rain may be completely unwelcome on your wedding day, engagement photos in the rain can be spectacular. Play with movement, light and colorful umbrellas. On a Bridge: What fun ways to play around with distance and architecture! In a Field: One with vibrant colors makes for spectacular pictures. 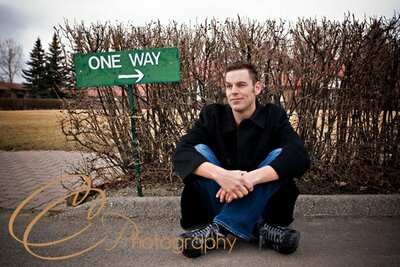 In the Street: Make use of humorous signs like this one, which says "One Way". Under a Streetlamp: This photo is a beautiful vertical shot. The effect of light is still there, even in the daytime. In a Phone Booth: Phone booths are a thing of the past, but if you can find one, their small spaces force closeness and can make for a very romantic shot. 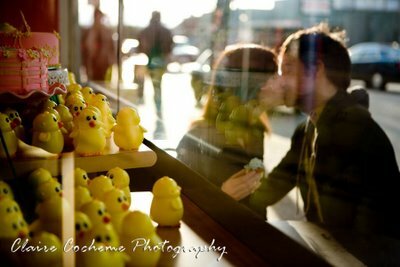 In a Bakery: Shoot your engagement photos in your favorite bakery. There are so many wonderful pictures that can come from using colorful icing, display windows, and sweet treats as props. These creative locations are certain to bring about spectacular engagement photos! 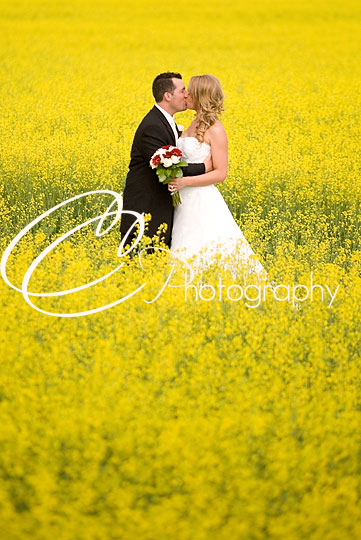 Find a wedding photographer anywhere in Canada, in our Directory.